Every time I think about my upcoming vacation in Sun Valley, Idaho I get so excited I can hardly type. I just want to put my chin in my hand, let my eyes glass over and day dream of dancing at Whiskey Jacques, a bowl of soul from Java and feeling the icy wind on my face as I ski down Baldy Mountain. As I explained in this post from the summer, SV is a mountain town with a thing for glamor. It's Old Hollywood heritage and rugged landscape create a lifestyle cocktail that's one part fur coats, two parts ski bum - with a small town twist. This outfit pretty much sums up the city-meets-mountain vibe I want to achieve with my Sun Valley wardrobe. A tailored boyfriend coat with cowboy boots and an Indiana Jones hat? Please - sign me up. This look is perfect for a coffee date in town, shopping in Ketchum or a movie and bottle of wine at the Magic Lantern. 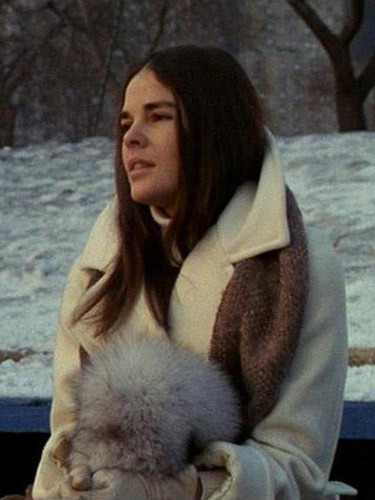 Alli MacGraw in Love Story. I mean, need I say anything here? A center part, a fur hat, a big white coat and a scarf... She's the picture of 1970's cool, which feels dead-on for this winter season. Sounds like an amazing trip, enjoy!